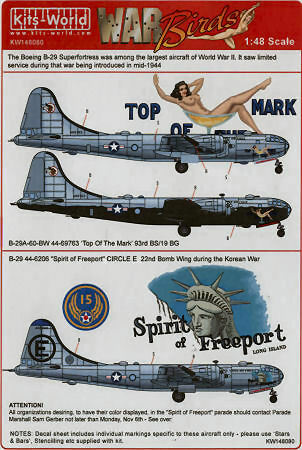 Kits-World is a very prolific decal company based in the United Kingdom that produces a wide range of nose art subjects in a wide range of scales. They tend to limit their releases to two subjects per release so they can provide more information and good resources for the modeler. Take a look at those decals. These are really nicely printed and the clear decal film is thin so these will work nicely on painted or bare metal surfaces. 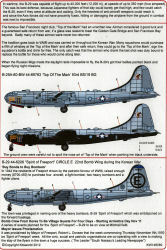 The instructions provide you with left and right side images for placement of the distinctive markings and these sets assume you will use the national markings and airframe stenciling out of the kit so they can focus their resources on providing some interesting subjects. 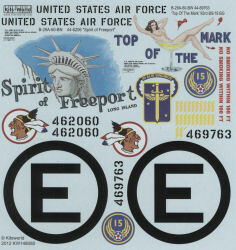 You can purchase these decals from a number of online retailers or directly from Kits-World Decals. My sincere thanks to Kits-World Decals for this review sample!